If the current SUV bloom has left any significant and lasting mark on the auto world, it’s to split our lovable high-riding utility vehicles into one of two categories. The latest is the crossover and its many iterations—smaller unibody creatures that ride high for ease of entry and weekend getaways and stuff nothing larger than a six-pot under the hood. Power goes to the front wheels or all four if snow is to be dealt with, but the priority has always been good manners and Costco runs. And then there are the gluttons, the body-on-frame behemoths that keep Al Gore up at night and turn wilderness into road kill. They’re a dying breed, but a few automakers have been completely unable to kill them off because the stubborn among us, those of us who’d buy snorting AMGs or ostentatious spitfire Jaguars given a cash infusion, keep snapping them off dealership lots. 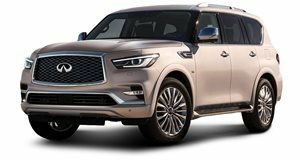 It’s because of that that Infiniti not only decided to build a luxury vehicle using the Nissan Patrol as the donor vehicle, but place it firmly in the latter camp of SUVs by leaving everything under the sheetmetal practically unchanged during the QX80’s latest facelift. The Patrol’s stout but classy lines have proved a boon to the Japanese automaker, resembling a rugged armored pillbox when adorned with a Nissan badge thanks to blacked-out A and B-pillars. But those same dimensions make the Infiniti variant, the QX80, look like a chariot sitting on dark 22-inch wheels. Using tasteful chrome as a tactic—lining the C-Pillars, side vents, roof racks, door handles, and running boards—the QX80 passes floor-to-ceiling glass with its reflection seeming only to miss two thoroughbreds calmly trotting ahead, tugging at the reigns and keeping the long spindles in the rims teetering forward. Plebeians stuck behind the QX80 will surely enjoy the raised bumper, slimmed taillights, and chrome accents that add visual height and width to the QX80 while anyone except Dwayne Johnson could get intimidated by such a large chrome grille invading their rear-view mirror. Though it’s not the picture of modernity to compliment the new exterior, the naturally-aspirated 5.6-liter V8, left unchanged from the QX80 we tested two years ago, fills in for the thoroughbreds and overcomes inertia with 400 antsy horsepower. In the heat of tourist-laden summertime LA where the best strategy for dealing with traffic is aggression, that kind of power yanks the living room on wheels into the passing lane with enough zest to satisfy passive-aggressive drivers and can propel the QX80 up steep hills enthusiastically with little regard for the fuel gauge. It was an outright pain pulling up to the gas station multiple times during our week with the QX80 only to watch the price counter reach for the sky—the 13 mpg EPA city rating for our 4x4 model (4x2 adds 1 mpg to the average) ensuring the Infiniti sucked through more than one tank in seven days, but economy is hardly the point of this vehicle. Yes, a few weeks of the QX80’s Infiniti’s fuel bill can surpass the monthly payment on an entry-level Camry, but if that leather-lined cabin is an indicator of anything, it’s that this Infiniti is not for those sitting on slim wallets. Perhaps because one of the main points of a luxury car is to spoil a driver silly, not only with comfort but with the pride points collected by every “ooh” and “ahh” that comes from the passenger seat, Infiniti created a new LIMITED package that seems specifically designed to coax more compliments out of guests. Suspicions of the word “exclusivity” didn’t cross our minds after our eyes scanned over stitched seats in the front and rear or when our hands ran over the sleek dark wood trim and sumptuous black headliner that calms the intensity of white leather. It’s a package that heftily upgrades the interior over the Armada on which it’s based, as you’d expect, but one carryover from the down water Nissan version is the absence of outside noise making it into the cabin. That void, which Nissan calls a “library level” of interior noise, is enabled by a thick acoustically-insulated glass used for the windshield and side windows as well as plenty of sound deadening material padding the rest of the cabin. The effect is magnified in the QX80 to the point that sounds of a rarely-strained engine never make it into the cabin. Pressing the starter button, the only confirmation that a warm fire-breathing Rube Goldberg sits in under the hood is a subtle rumble trickling up to the driver through the heated and cooled front seats. The shifter is unapologetically old school too. 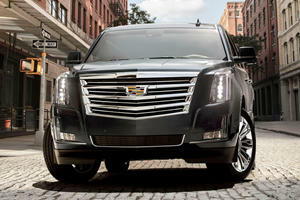 Pull it back into Drive and suddenly those 413 lb-ft of torque have 7 gears to be manipulated by. Shifts remain imperceptible when the throttle is feathered, but try to ask the V8 to repeat the QX80’s 7.5-second 0-60 mph time and the automatic resorts to a more primal state, complete with reassuring pauses between ratios. Like its competitors, the QX80 can tow decent heft, 1,655 pounds when relying only on its own faint brakes or 8,500 pounds with a braked trailer. With an electric steering system making it so the wheel never knows the meaning of the word “effort”, a driver can seesaw through traffic and tight corners without using more than two fingers, breaking a sweat, or putting a stop to the lavish driving experience. A reworked suspension and tire tinkering further removes the discomfort of disconcerting potholes left open by tax cuts funneled into the stock portfolios of QX80 buyer types, and the illusion of luxury could last the extent of the drive if it wasn’t for the brakes. Tuned to bring almost 7,000-pounds of mass to a standstill gradually, the QX80’s brakes do not exhibit their true stopping power until a driver dives uncomfortably deep into the brake pedal’s lane of travel. Anxiety, however, can be lessened by employing Infiniti’s suite of driver aids, which can be activated through a button on the steering wheel whether or not the intelligent cruise control system is in operation. With the system on, a front-facing camera combines with three radar sensors to scan the road ahead and around. If the system senses a driver following too close to the car in front, it’ll either begin to slow the SUV down itself or amplify the braking pedal’s effect when a driver finally decides to slow down. Interestingly, the QX80 features Infiniti’s Lane Departure Prevention system rather than the Active Lane Control system found in other Infiniti models, the latter of which we found to be far better when we drove the Q60. It works by applying the brakes on the wheels opposite the side that’s meandering out of the lane in attempt to bring the SUV back into its intended path. These features are a welcome touch for such an old-school beast, but they make up the only part of the QX80’s technology suite that feels like it was designed in the last decade. With rear entertainment screens now an inch larger than in the older QX80 and a plethora of connection ports one can use to feed them video, the 2019 QX80 may fool the average dealership lot tourist into thinking the tech is on par with the best the industry can offer. But anyone familiar with German luxury vehicles will spot the infotainment system’s age in the buggy interface of the 8.0-inch touchscreen and sniff it out in the unintuitive nature of the human/machine relationship. Apple CarPlay and Android Auto aren’t even offered here, an injustice that shouldn’t be suffered by a vehicle with such a classy forward-thinking face. If anything, the QX80’s technological weaknesses can highlight how stubbornly Infiniti has held on to the past with this one, at least when seen with optimistic eyes. That could be a major selling point for anyone scorning Lincoln for putting an EcoBoost engine into the Navigator or those who grew tired of the ludicrous prices Cadillac is starting to ask for the Escalade. Not like the QX80 is a bargain, though. Starting at $64,750 excluding destination for a base 4x2 model, our 4x4 LIMITED QX80 had its sticker inflated to $84,110 excluding destination thanks to the $2,900 driver assistance package and the $2,450 theater package, which includes the two 8-inch monitors behind the driver’s and passenger’s headrests. Another $2,800 is set aside for those muted but classy 22-inch wheels and $5,700 is the price of the deluxe technology package that adds the climate-controlled front seats, a 15-speaker Bose sound system, a rear-view mirror that can display what the rear camera is seeing if center seat occupants are too tall, and hydraulic body motion control among other extras. The rest of the sticker was pumped up by the addition of cheaper features like illuminated kick plates and a carpeted cargo. It’s these features, coupled with a large V8 and an imposing yet attractive presence, that make the QX80 retain one of the most important characteristics of an SUV with its soul stuck in the mid 2000s: the fact that it’s a machine meant for everyone but the driver. Friends and family are sure to want rides, colleagues will look away in envy, but the driver remains an interchangeable cog in the system, neither suffering or enjoying much. Sure, their egos will love how many eyes float the QX80’s way and the smooth ride will lessen the stinging pain of a child’s “are we there yet?”, but provided a chauffeur, it’s best to enjoy the fruits of the car payment and QX80 gas bill from the back seat. 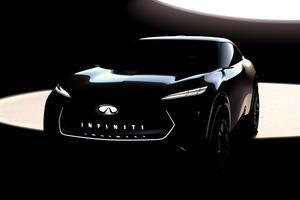 Infiniti will preview its electrified future at Detroit this month. 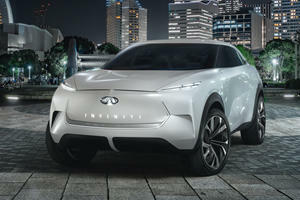 A concept previewing Infiniti’s first ever fully electric crossover will debut in Detroit next month.